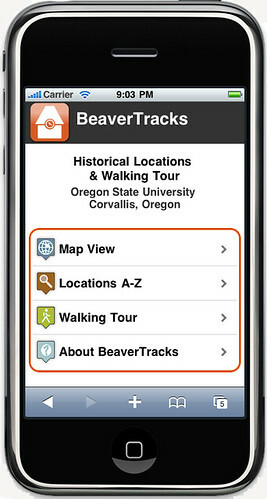 BeaverTracks is an interactive mobile guide and walking tour of Oregon State University's historical locations. History comes to life on the Oregon State campus, using the latest technology to open a window into the past. Using selected mobile devices, you can find historical sites of interest by searching for a location, viewing the locations on a map, or by browsing a list of names. At each of the 22 locations, you get a brief history and can browse a catalog of historic images. Depending on your mobile device you can also take a historic walking tour of campus. The Walking Tour is a location-based guide to OSU's campus. Using your device's GPS, the interactive walking tour finds historical locations near you and plots the directions to them on a map. To start the tour, click on the walking-man icon at the top of the page. As you walk to the various locations, click on the map icon to get directions to the next spot on the tour. Warning: The walking tour may be missing paths or sidewalks. Do not use as a real-time mapping system. BeaverTracks connects the past to the present by linking historic images to current campus locations. All images in BeaverTracks are from the OSU Archives collections and permission must be obtained to publish or permanently display reproductions of the materials. Please contact OSU Archives with requests or questions. All images in BeaverTracks can also be found on OSU Archives Flickr photostream. BeaverTracks has been optimized for smartphones, but can be enjoyed on any modern Web browser. The Walking Tour can be used on almost any device, but the accuracy of locating your position varies dramatically. For best results, use the the tour on a device with a browser that supports geo-positioning like the iPhone or Android. BeaverTracks was developed by OSU Libraries and OSU Archives staff. It was inspired by NCSU Libraries' project WolfWalk. The virtual walking tour is based on the print publication OSU Buildings & Services Walking Tour. You can also access it from OSU Libraries mobile site, which provides hours, faqs, book search and more. Go to http://m.library.oregonstate.edu and click on BeaverTracks.